The charts for long volatility Exchange Traded Products (ETP) like Barclays’s VXXB, VelocityShares’ 2X leverage TVIX, and PowerShares’ 1.5X levered UVXY are astonishing. I’m not aware of any other widely available securities that have declined like these. Why would anyone invest in these perennial losers? Why doesn’t everyone on the planet short these funds? It turns out that there are reasonable reasons to buy these funds, and some people make money doing it. And a lot of people short these funds; it’s a crowded trade—to the point where it’s sometimes not possible to borrow the shares to short them. It’s not easy money either way. Unlike a short position in most equities fear is not your friend when you are short a volatility fund. When the market gets scared the equity declines are scary, deep, and fast—and volatility spikes up dramatically. One characteristic of a short position is that its leverage moves against you if you’re wrong. When you first open a short position a 10% gain in the stock you shorted will cost you 10% of your position’s value, but the next 10% gain in the security will increase your loss by 12.2%. This increase in leverage increases rapidly if the security moves strongly against you. See this post for more information on this phenomenon. Typically (75%+ of the time) the prices of long volatility funds like VXXB, UVXY, and TVIX are battered by contango , but when the market tanks they turn into beasts. First of all the VIX futures that these funds are based on spike up, second the VIX future’s term structure goes into a configuration called backwardation—which boosts the ETP’s returns, and the 1.5X and 2X funds often experience a compounding effect that boosts their returns past their benchmark leverage levels. Long volatility funds have not existed all that long, the first one was introduced in 2009, so we don’t have actual data for the earlier bear markets, but we do have historical data for the 2011 correction, where TVIX’s value went up 550% in a few months. 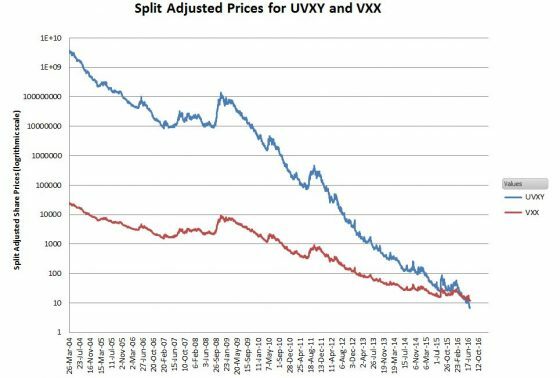 In my simulation of TVIX’s prices that goes back to 2004, I show that that the prices of TVIX would have gone up 15X in the 2008/2009 crash. Now you can see why some people are interested in going long with these funds. In addition to the risks of typical market corrections and bear markets, a short volatility position is also vulnerable to a Black Swan type event. A major geopolitical event, natural disaster, or terrorist attack could cause a very large, essentially instantaneous jump, in the volatility funds. The record one-day VIX jump so far was a 116% jump in February 2018, but in this post I postulate that even bigger one-day jumps in the VIX are not out of the question. The VIX futures that underlie the volatility ETPs don’t track the VIX moves directly, typically the mix of futures used moves around 45% of the VIX’s percentage move for the 1X funds, but with the 2X leveraged funds that still gives a 90% daily jump in their prices. On the February 5th, 2018 the VIX futures jumped almost the same amount as the VIX, 96% vs 116%—resulting in the termination of Credit Suisse -1X XIV and the detuning of SVXY down to a -0.5X fund. If an event like this happens when the market is closed there will be no chance for protective measures like stop loss orders to execute. Even if the event happened during market hours conditions would be chaotic, and the market would likely shut down quickly. If I haven’t managed to scare you off by now, the next section discusses specifics of initiating a short trade. These securities are always in the “hard to borrow” category, so it’s very likely at least a phone call to your broker will be required to create a short position. It’s also very likely you’ll have to pay an ongoing fee to borrow the shares. Plan on the annualized fee being at 3% for the non-leveraged VXXB. You’ll need to have margin capability setup in a taxable account. Short selling is not allowed in retirement accounts such as IRAs or 401Ks. You’ll need extra cash / marginable securities in your account as margin. There are two different amounts required (which can vary by broker and by security), one to initiate the trade and another to maintain your position. The initial percentage will always be greater than or equal to the maintenance position. Leveraged funds like UVXY and TVIX require extra margin. 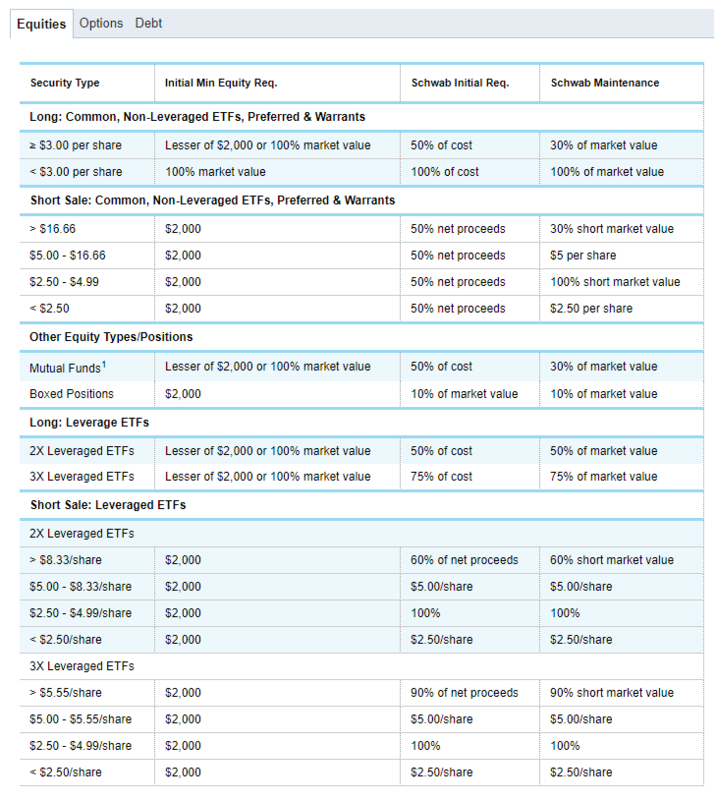 The chart below shows Charles Schwab’s requirements for shorting ETFs as of 22-Feb-2019. If your trade moves against you to the point that you don’t meet the maintenance requirements you’ll get a margin call from your broker. Not a fun thing. You have two choices at that point, either add more money / marginable securities to your account or reduce your short position by buying back some of the security. Don’t expect your broker to be patient. If you hold a short position it’s critical that you have an exit plan. A few people might have a small enough position and enough margin to weather even the darkest bear markets, but most people won’t have the capital or the temperament to hang in there. Emotionally it is very difficult to close out a short volatility position with a large loss. Clearly, your timing has been bad and there’s the near certainty that eventually contango will wear these funds back to levels that would be profitable for you. On the other hand, not having an exit plan raises the very real possibility that your broker will be the one closing out your position, not you, likely at the worst possible time. One protective strategy would be to buy out-of-the-money calls at strike prices much higher than the current trading value of the securities. That way you can limit or mitigate your maximum loss, even during a Black Swan. Essentially you’re buying an insurance policy with a high deductible. It wouldn’t be cheap because the options would likely be expensive and usually expire worthless, but the peace of mind might very well be worth the cost. One harsh reality of a short position is that while you are exposed to potentially very large losses the best case profit you can realize from your initial position is limited to 100%. For example, if you sell short $1000 worth of VXXB your maximum profit can’t be more than $1000 because VXXB can’t drop below zero. And even with the ravages of contango VXXB’s split-adjusted price will never get all the way to zero. As a shorted security drops in value the leverage of your position drops also, eventually approaching zero. If your short has been successful at some point you’ll need to short additional shares to get your leverage and additional profit potential back up. I quantify this leverage with a simple formula: Leverage = P/Po where P is the current price and Po is the price you initially shorted at. Let’s say you are comfortable with a leverage factor between 1 and 0.7. If it drops to .7 then you would short enough shares to bring your leverage back to 1. So if you were initially short 100 shares at $10, you have a maximum profit potential of $1000 at that point… If the price has dropped to $7, then your maximum additional profit has dropped to $700 and your leverage has dropped to 0.7. To get your leverage and additional profit potential back to 1.0 and $1000 you need to short an additional $300 worth of shares (~43 shares). There are some alternatives strategies that address some of the risks and restrictions of taking a short position. Of course, they introduce their own limitations, risks, and restrictions. ProShares’s SVXY and VelocityShares’ ZIV are inverse volatility ETPs that avoid the variable leverage and unconstrained loss aspects of a short position and are allowed in retirement accounts. In exchange for solving those problems, you pick up path dependency and volatility drag. See these posts: How Does SVXY Work?, and Ten Questions About Short Selling for more information. Options are available for SVXY, UVXY, and VXXB. Instead of going short on these ETPs you can buy or sell puts and calls. Buying puts eliminates the potential for an unconstrained loss, but the premiums are steep. No easy money here either. One additional caveat, because of their frequent reverse splits longer-term options will likely become “adjusted” options that have the number of shares they control changed and track a modified version of the security price. This happens in conjunction with the reverse splits. Theoretically, no value is lost, but by all accounts, these options become less liquid and the bid/ask prices widen. These options are American style, so with long positions you’ll always have the ability to exercise them, but caution is warranted. 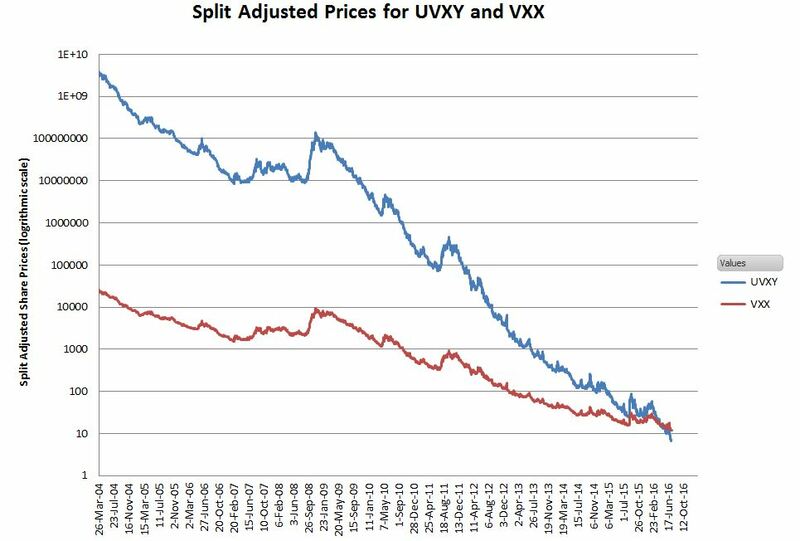 For more on this see UVXY Reverse Splits. I’ve had direct contact with people that have lost hundreds of thousands of dollars on both sides of these trades. Honestly, I think considerably more is lost on the long side, but the blowouts on the short side tend to be quick and vicious. Most rookies get greedy and risk being blown out by even a mild correction. If you can manage to hold (and rebalance) your short position long enough it’s a rational trade—but that’s a big if.